Refuse – Reduce – Reuse – Recycle – Rot: Zero waste has had its debut 1970 in Oakland, California and reached public attention only in 1998. By 2002, the term “zero waste” moved from theory into action. Today, people like Lauren Singer and Bea Johnson have proven with their blogs, videos and stores that even in 2018, it is absolutely possible to live zero waste – even in a big city. By now, a lot of people have followed this environmentally friendly path and are producing not only less trash (which directly find its way to a landfill) but also less recyclables. Compared to the world population, these people are unfortunately still only a small percentage that has taken into battle against trash islands and dying fauna. On average, a Czech household still produces 180 kg of non-biodegradable trash PER YEAR! Some blame the supermarkets, saying that the offer is very limited to packaged food and it is true: walk into a regular supermarket and you are surrounded by packaging, plastic bags, more packaging and cans. But: the market works after demand, not after the needs of our planet earth. We have to first think differently, so we change the demand and thus the supermarkets offers. Considered as waste are all materials that cannot be turned into something new and directly get transferred to the next garbage dump. Even the ones that can be recycled (plastic, paper, glass, cans) are considered waste, since they need a lot of water and other resources to find their way back into the shelf. Most often, the landfills to which non-recyclable trash is brought to, are abandoned places in nature or artificially modified landscapes that are considered “not good enough to look at” and thus are being used as the last place garbage lands in. Part of said trash group are: plastic packaging, tetra packs, ribbons, paper packaging (flours, sugar, etc. ), clothing tags and many more. If you want to see what impact you have, collect all the trash and recyclables you use throughout a day; the result will surprise and maybe even shock you. Why should I go Zero Waste? Living a zero or lower waste life has other benefits than “just” helping our environment: You will find that there will be more money lying on your bank account at the end of the month! Not only that; you eat healthier, better products and often support local farmers! How does a zero or lower waste life get you more money, you ask? When buying produce, we often are forced to buy a certain amount of it. Now, a family of 4 might need more of a product than a 1 person household and not rarely does food go bad in the household of the latter. Whenever you throw food away, you automatically throw bucks in the bin, too. On top of that, many vegetables and fruits produced locally are less costly than the ones in the supermarket – as they did not have to be flown around the world to land in the shelves. One could argue that living in Prague, a capital city with 1.2 million inhabitants, makes it impossible to live a lower or zero waste life. In fact, it only takes a bit of organizational and researching skills and in order to make our city a little better, here comes our little helper for all those already trying to live zero waste or all the ones that want to try! How do I live Zero Waste in Prague? The most obvious solution to packaging free food is going to farmers markets and bringing your own bag. Why would food – especially vegetables and fruit – need to be packaged? Some argue that they do not like their food touching each other or the thought that someone else has touched it before keeps us from buying these products. The solution? Bring your own packaging in form of smaller jute bags and rinse your produce at home before using! Farmers markets are not only nice to walk through, they offer a wide range of products you need in your daily life – and just like that you base your eating habits on seasonal fruit and veg, too! 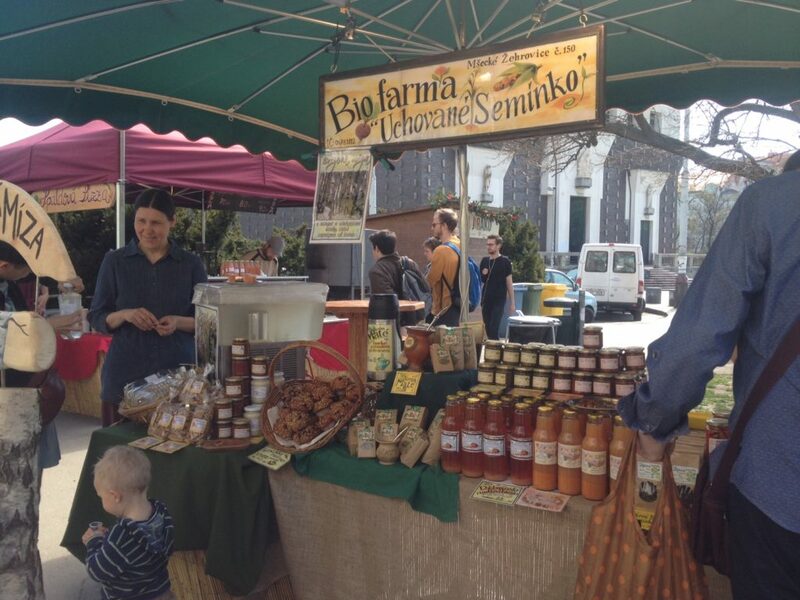 Not only vegetables and fruit but also meat, eggs, milk, butter, yogurt and soap can be bought in one place! Some of them even offer pasta, for all the pasta lovers out there. Simply bring your mason jars or jute bags to refill! It is quite common for stores in the US to have bulk sections; a trend that is reaching Europe and Prague in particular only slowly – but steadily. This awesome place opened around 3 years ago on Bělehradská and also has a second, even bigger location in Dejvicka! Bez Obalu or “without packaging” is the bulk store Prague was always missing! Simply ring the bell outside of the house and go straight ahead through a second door (follow the green sign). The latter reveals a peaceful oasis: a quiet courtyard with a hang mat outside the store – bound to get you in the right mood for your shopping experience! Not only from the outside Bez obalu is a pearl; their staff is absolutely amazing, super helpful and knows their products. Awesome service and happy customers guaranteed! 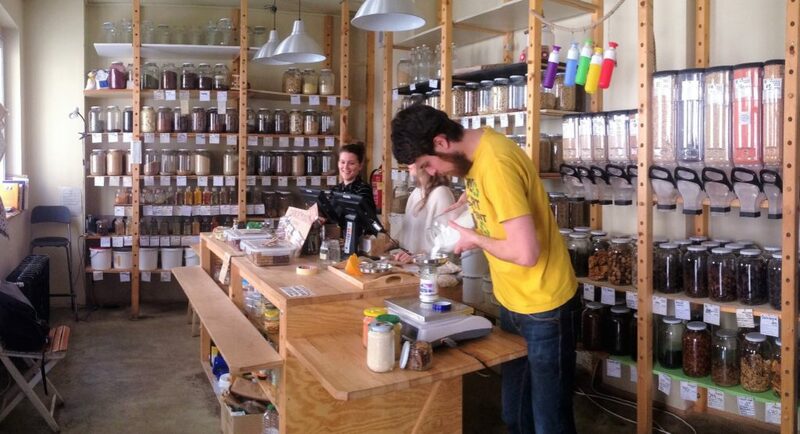 Bezobalu not only offers products in bulk like flour, soda, nuts, oils and so on, but also does Zero Waste courses! 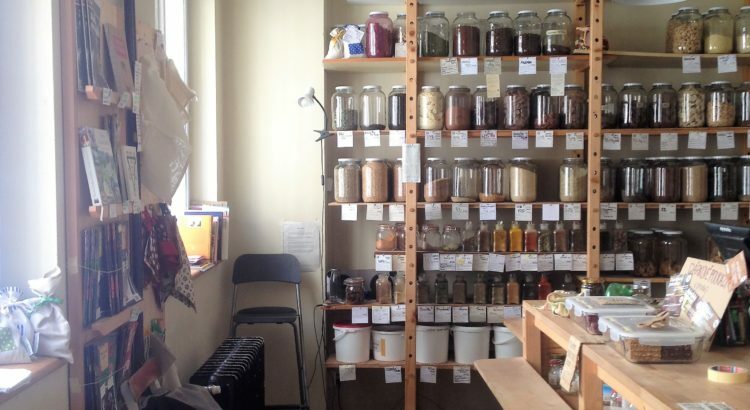 Bring your own mason jars or reusable packaging and fill up your pantry! Or use one of the empty jars that Bez Obalu collects from contributors. So, if you have too many glass jars standing around, be sure to drop them at their shop so they can be reused! Don’t we know it all? It’s bursting hot outside and you forgot your water bottle at home. Thirst reigns over our environmental consciousness and we end up buying a plastic bottle of water. Before tossing it in the trash (which is not where it belongs in the first place) or into a recycling station, carry it home and reuse it as shower gel holder (when making your own shower gel), to keep your salad dressing stored so you won’t have to buy one or make one every night, get creative with it OR take it with you on your next shopping trip for liquids! Empty glass jars from sauces, honey or other produce are great storing units too, by the way! Pack them on your trip to Bez Obalu and refill with nuts, couscous, flour and other bulk produce. It is not only more environmentally friendly but also looks a lot nicer in your pantry and can be piled up easily. The jars are also great if you are a coffee lover and need to restock. A lot of coffee places in Prague sell coffee by the gram and will be more than happy to refill your empty mason jar! Now something for all the people that are looking for a hobby – or are just tired of not knowing what exactly you are putting on your skin. 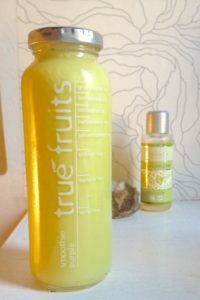 Making your own shower gel is super easy and also way cheaper than buying a bottle full of nasty sounding ingredients! Simply get curd soap (available online or in BIOOO at Kotva) and whatever essential oils you want your soap to smell like – or go fully natural and get a lime, a lemon or a mandarine! Enjoy your very own shower gel without nasties! Comment: Even though your gel might look very fluid in the first few hours, do not add more soap as the mix will harden overnight and gets too hard when more soap is added. 5. Make your own tooth paste! Did you know that there are way too many nasties in commercially produced toothpaste? Not only micro plastic particles but also fluorides that when used too often, makes your teeth blowy and attacks your metabolism. Making your own toothpaste is done within 5 minutes and will last you just as long or even longer as a plastic coated one! In a bowl, combine bicarbonate soda and Stevia and give it a good stir. Meanwhile, melt the coconut oil till fluid. Then add your soda mix and mix well. Stir in the peppermint oil and directly fill into a mason jar and: DONE. With a lot of vegetables and fruit in the house, there will be trash. The good news is they are biodegradable and even more: the compost can be used to nurture your little herb or vegetable garden at home! Here is a great way of making a low cost DIY bokashi compost at home. Not only is this compost smell-free; it also makes liquid compost that can be filled into a keep jar easily – which your flowers and vegetables will love for sure! Especially throughout summer season, it is easy to grow tomatoes, cucumbers, herbs and salads in your garden or on your balcony. You do not even have to start from square 1. Many vegetables such as celery, salads, onions, garlic, etc., can be re-grown! Simply put the root of the used food in water till they start to make new roots. Then put them in a pot with some earth and your homemade compost and water. A few weeks down the road you will be able to harvest your veg! Yum! 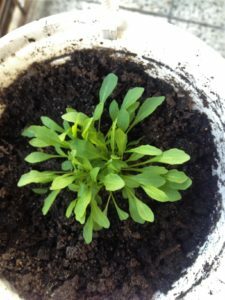 Nothing tastes as good as something homegrown: This cute rocket plant could be yours! Not only do second hand shops hold hidden treasures, you also have an impact on production of textile when getting your clothes in these shops. A lot of clothes from big brands and stores are made from polyester. Polyester is a synthetic petroleum-based fiber and is therefore made from a carbon-intensive non-renewable resource. Even worse news: More than 70 million barrels of oil are used to make polyester each year! The production of the latter uses harmful chemicals and if emitted to water and air untreated, who is being harmed? Exactly, the sea and even fresh water that we consume! You might laugh now but this is far from a joke. In a paper of 2011, Mark Browne, now a senior research associate at the University of New South Wales, Australia, found that microfibers made up a whole 85% of human-made debris on the shorelines around the world! Donate and shop to one of your local second hand stores or even to the salvation army – for people in need might still see the beauty of that blouse you no longer want to wear! Got some inspiration for your zero or lower waste challenge? Then collect your jars, bring some clothes to charity and cook some fresh food from local produce! Happy zero wasting! Hiya! In your post you mentioned that ‘A lot of coffee places in Prague sell coffee by the gram’. I was wondering how I can find these? Do you know of any places to recommend for this? Thanks so much for your question. – Můj šálek kávy (with their own roastery), Křižíkova 105, Karlin, Prague 8 – heavenly! – Kafe Na Schodech, J. Želivského 31, Žižkov – lovely staff & great coffee! These are just a few of many places around the city; if you happen to sit in one of your favourite coffee places, simply ask them if they sell loose coffee beans – chances that they do are very high. What can we do with our Organic waste in Prague if we dont have a Garden or space to use compost?? Hi, I’m new in Prague and I’m searching where could I discard cooking oil… I use to fry and now I need to put it away…. Do you know? Thank you. Inspired by Brno’s system of public oil disposal via special containers in every neighbourhood, Prague’s government is considering installing such oil waste containers, too. As of right now, the new system for oil disposal has not been introduced – yet! KOMWAG – Prague’s waste company – however, mentions on their website (https://www.komwag.cz/en/waste/how-to-separate-waste-properly/food-waste) that “the general public may use the collection yard in certain cases (e.g. oil for deep-frying). Otherwise this sort of household waste is classified as mixed municipal waste and should be put in the proper waste containers.”.